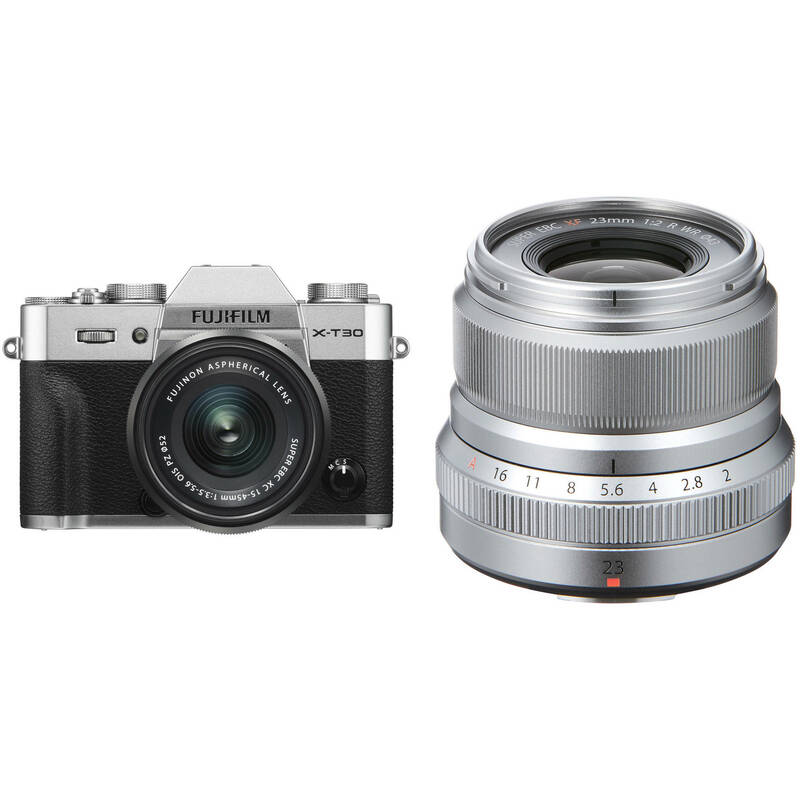 A well-rounded kit, the silver FUJIFILM X-T30 Mirrorless Digital Camera with 15-45mm and 23mm f/2 Lenses from B&H bundles the sleek mirrorless camera body with the versatile XC 15-45mm f/3.5-5.6 OIS PZ zoom lens and the compact XF 23mm f/2 R WR wide-angle prime. Box Dimensions (LxWxH) 9.7 x 8.0 x 7.8"
X-T30 Mirrorless Digital Camera with 15-45mm and 23mm f/2 Lenses (Silver) is rated 5.0 out of 5 by 1. Rated 5 out of 5 by Peter from Better than expected! The Lenses are very sharp, especially the 23 mm F2 Prime. The autofocus is so fast compared to my OMD and Sony Alpha digitals that I’ve already taken the picture before I realized it had already done both. No wasted time with this camera.. Very easy to navigate the menus and the he Q button design with the rear wheel select options is an absolute pleasure. I’ve not even gone into the auto modes yet as I am thrilled with the ease of use manually along with A and S modes. I highly recommend this camera with a Prime of choice and the bundled 15-45 XC is a pleasant surprise. The image quality and features at this Price are hard to beat. I’ve worked with Minolta, Olympus and the Sony with classic Minolta lenses through many years. All good and each lens and body has its strength, but this Fujinon is way ahead in many ways. Yes, the body is small and the Q button is close.... get used to the adjustment. That’s what is designed for, light weight and easy carry, it’s so convenient and fast, don’t even think about it, do it. You can look at it many ways, but the lens investments make the body cost disappear as time goes on. Cameras get old, superior glass is nearly forever.